The 52.8 metre motor yacht Passion, jointly listed for sale by Burgess and Northrop & Johnson, has been sold with the buyer introduced by Northrop & Johnson. Built in steel and aluminium by Swedeship to a design by Diana Yacht Design, she was delivered in 1986. This highly successful charter yacht was rebuilt in 2003 and underwent an extensive refit in 2008/9. Completed upgrade work included the installation of zero-speed stabilisers, new main engines, new auxiliary generators, new bridge electronics, and new galley equipment as well as a complete paint job. In addition there were several interior upgrades including new carpets, new linens and A/V system enhancements. 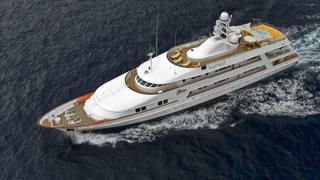 Passion accommodates 12 guests in six cabins. The full beam owner’s suite, with private study and en suite separate shower room and whirlpool bath, is located on the main deck and is adjacent to one of the two VIP suites. The remaining cabins can be found on the lower deck and include one king VIP suite, a queen double cabin, two twin cabins. There is also a gym with its own en suite bathroom and adjoining steam room as well as a Pullman berth suitable for staff or crew. All guest cabins have full entertainment systems and en suite bathroom facilities. Twin 1,710hp Caterpillar diesel engines give her a range of 3,500 nautical miles at a cruising speed of 14 knots.